This site does not work well in older versions of IE. Please consider upgrading or trying another browser. World's first versatile camping fork, crafted with a unique ring-design, that delivers a safer way to roast Campfire Cones and other popular campfire foods. What are Campfire Cones you ask? Campfire Cones are quickly becoming America’s newest dessert trend. With one bite of their delectable, gooey goodness, it’s easy to taste why. 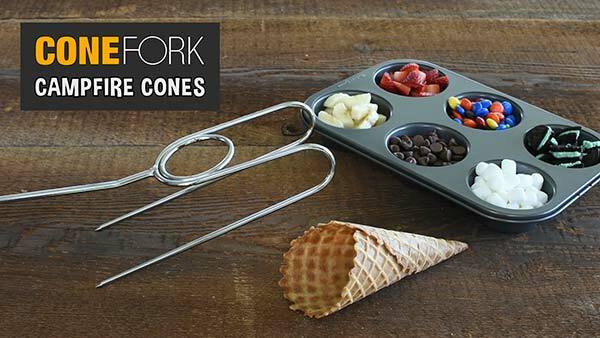 Whether you favor the classic marshmallow and chocolate combo, or are in the mood to indulge in a new confection, the Cone Fork is the perfect tool for the job. 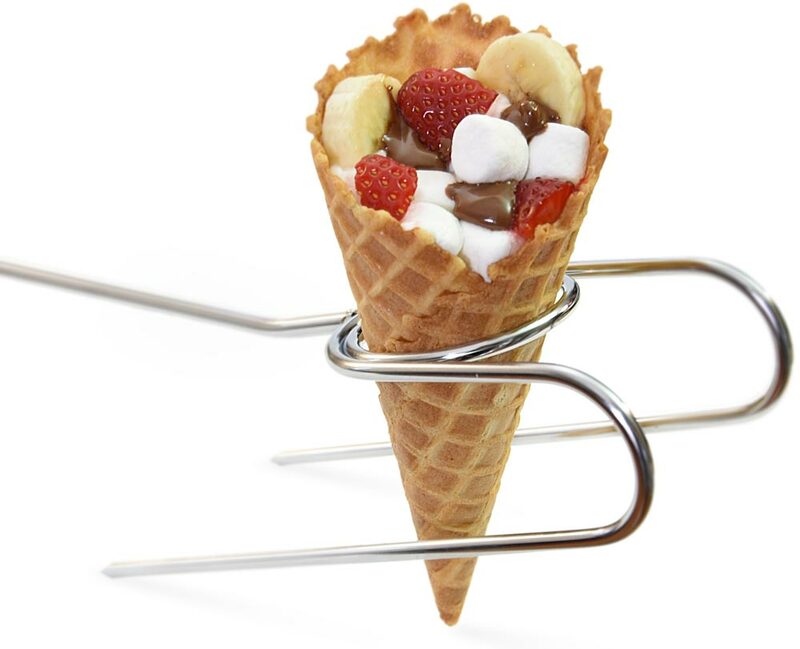 The Cone Fork’s unique ring design allows the sweet-filled cone to easily and safely be roasted to perfection over a fire. So, whether you’re vacationing on a summer camping trip, or huddling around a backyard fire this winter, the Cone Fork is sure to add S’more fun to your campfire experience. Heading into the great outdoors doesn’t mean you have to give up eating well. The Cone Fork ensures full bellies and happy tastebuds by allowing you to cook a variety of your favorite foods with one versatile tool. 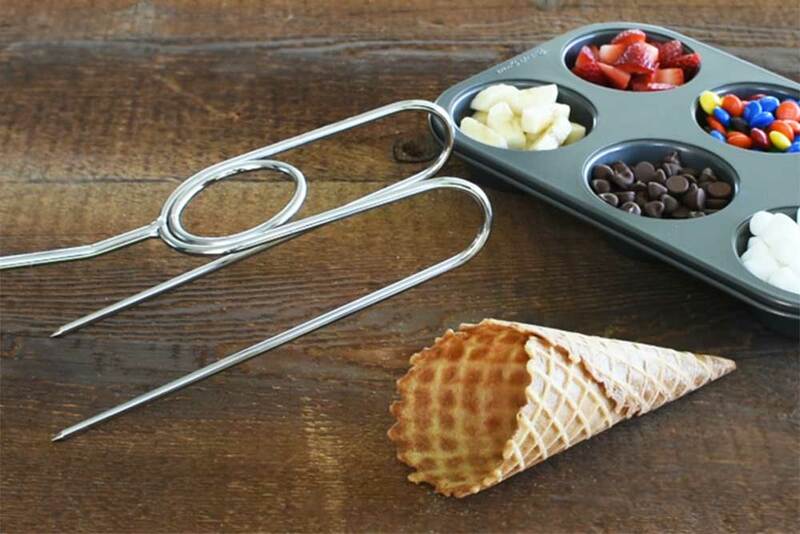 The unique design not only features a ring for holding cones but also includes a wedge for holding larger items with traditional style forks for everything else. Simply put, the Cone Fork is the only tool you need to master the art of campfire cuisine. And with that triumph literally under your belt, anything is possible. Today it’s dinner, tomorrow the world! *For best results, some items should be wrapped in aluminum foil while cooking. Ring in the new camping season with a fork specifically designed for Campfire Cones. Our unique design, allows you to roast Campfire Cones of various sizes. 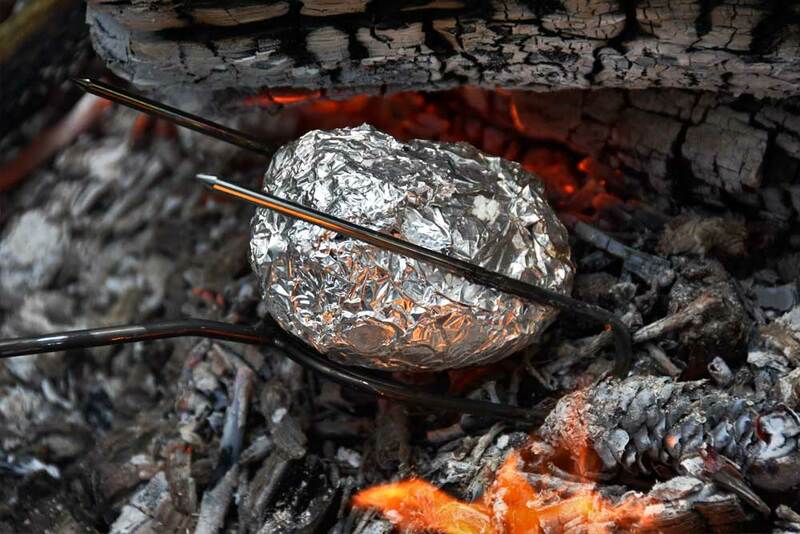 Simply, stuff your foil-wrapped cone full of your favorite ingredients, place it in the ring and roast it to sweet perfection over an open fire. 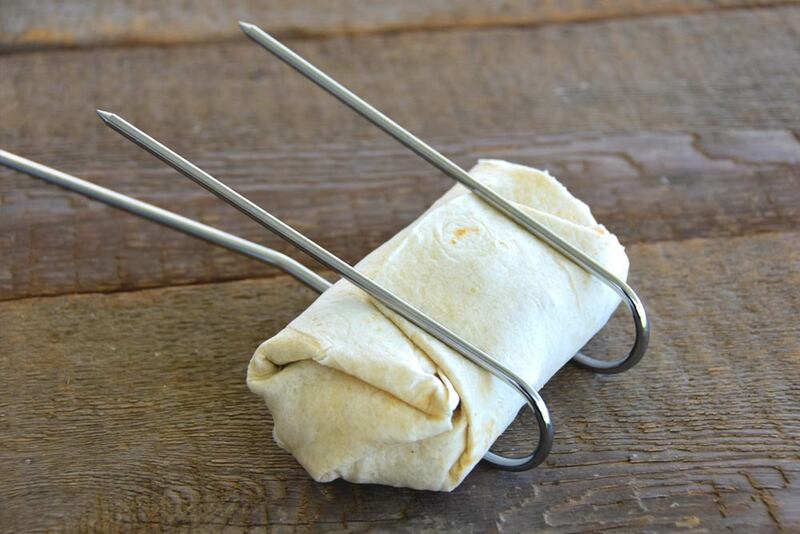 Get a wedge up on the competition with the capability to cook larger items, such as burritos, corn on the cob, a variety of foil packet meals and any other item that can be wedged between the forks. Feeling nostalgic or just hankering for a taste of those old school classics? Our traditional style forks can be used to cook hot dogs, sausages, or marshmallows, just like you had when you were a kid. This pint-sized cooking tool packs the punch of its larger counterpart but at a fraction of the size. A mere 17 ¾ inches when compact, the telescoping handle allows the fork to reach 34 inches when extended. So, if space is short but your love of campfire cone cooking is big, the Mini Cone Fork is sure to become your newest campfire essential. Click to watch how to make a campfire cone. Fill your cone with your favorite ingredients. Wrap the cone completely in aluminum foil and place in the Cone Fork ring. Remove from heat, let cool, unwrap and enjoy! Put all ingredients together in tortilla and wrap. Spray inside of aluminum foil with cooking spray. Place burrito on the aluminum foil and wrap tightly. Rotate the burrito so it cooks on all sides. Cut the meat and veggies into uniform, 1" pieces and marinate ahead of time, if desired. 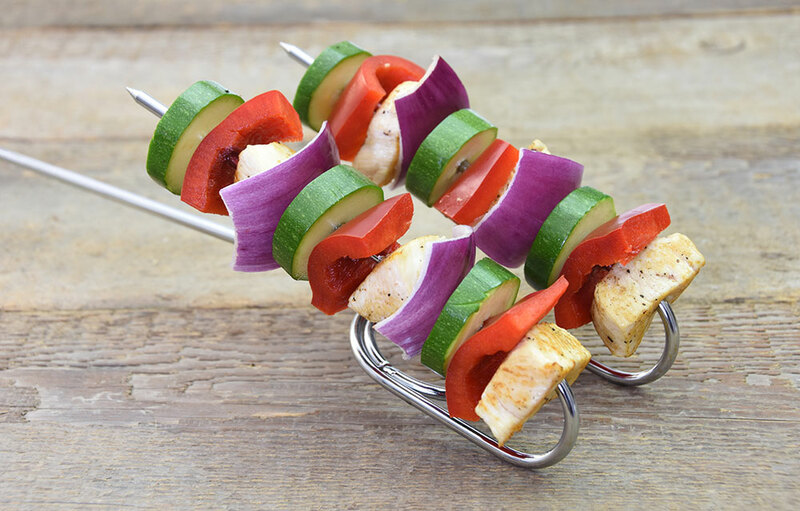 Thread your veggies and meat onto the Cone Fork skewers, alternating ingredients as you go. Tip: If your veggies and meat require different cooking times, you may put the same ingredient onto each skewer, to better control cooking time. Remove from heat, un-skewer and enjoy! 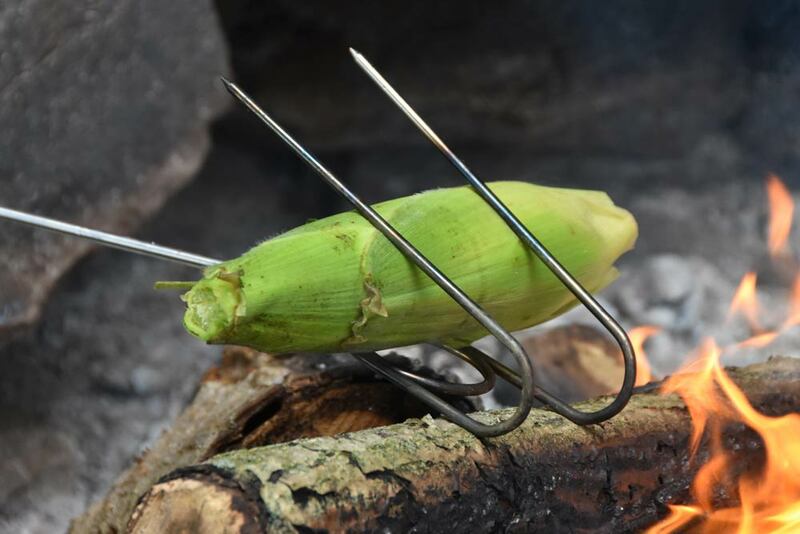 Place corn in the Cone Fork wedge with the husk still on. Remove from heat, let cool, unhusk and enjoy! Spread all ingredients evenly on tortilla and roll to wrap. Place rolled tortilla on the aluminum foil and wrap tightly. Rotate the wrap, so it cooks on all sides. Remove from heat, let cool, unwrap foil and enjoy! Wrap the pouch tightly in the aluminum foil and place in the Cone Fork wedge. 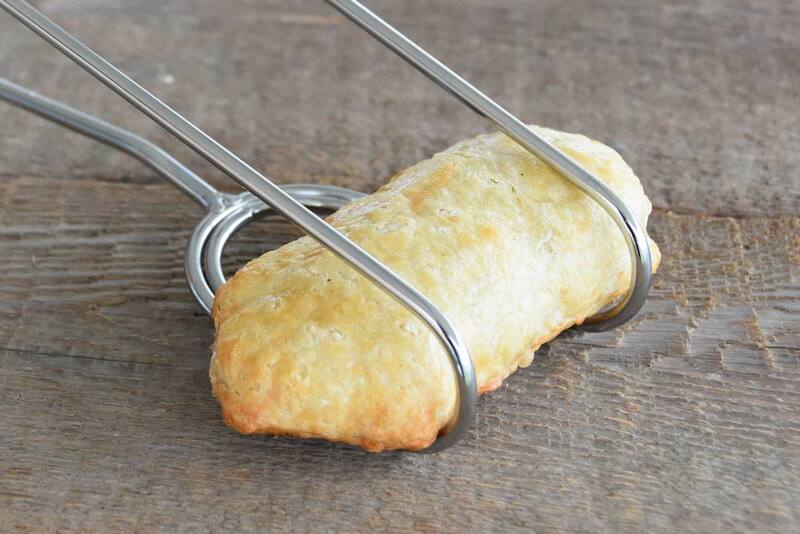 Wrap the potato completely in aluminum foil and place in the Cone Fork wedge. *Cooking times are estimates. Actual times may vary, based upon the size of your fire and distance from the heat. Please remember to use caution when handling hot items. Get it, Fork it, Eat it! Get your Cone Fork's now!